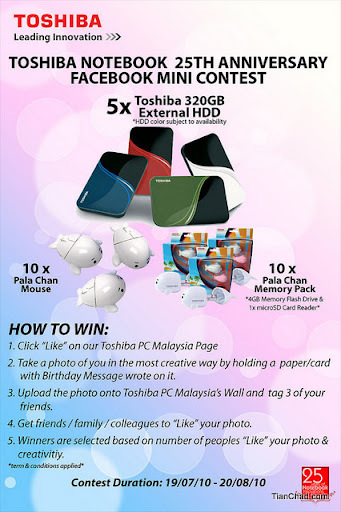 Just wanna share with you guys a TOSHIBA Facebook contest that I was joining too as I really need a new hard disk drive to keep all photos that I have take this year~! You can easily win these prizes as long you are creative and get your friends to vote for you yo~ Pala Chan is very cute o. "Happy Birthday TOSHIBA~!! Your Giveaway comes at the right time! Hopes my creativity works =D"
Please Like my photo friends! I need a new HDD to keep my photoS~ Thanks! Hope you can like my photo at the above mentioned links and join the contest too~! Thanks again! !